Back in Dec 2000 I (the webmaster) saved these instructions off of another forum member's web site. Since then that site has died so I've had a lot of requests for these instructions. To make everyone's life easier I figured I'd simply repost them here! Please remember that this was not originally written by me, so I won't be able to answer specific questions about why a certain decision had been made. This *is* a strong, reliable, cheap, and most importantly flexible way to hang a CRT Projector. Though personally I feel that he used waaay too many lag bolts. 2 to 4 (instead of 8) per piece of unistrut should be more than adequate. 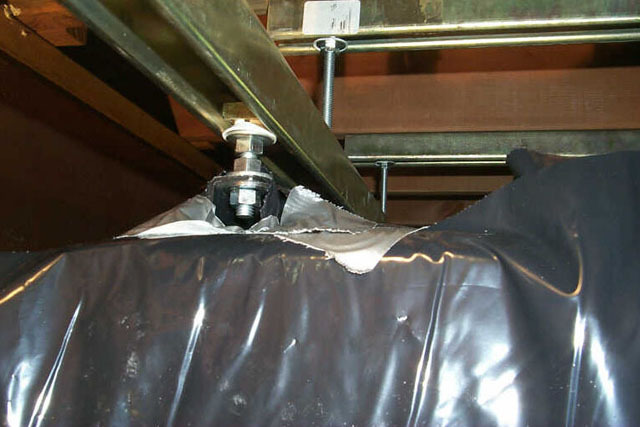 Looking for examples of successful Unistrut CRT projector installations & other hints? See this document provided by forum member 'Roo' (Andrew Low). Thanks Roo! OK, first - I apologize for the crude images. I am still building the rest of the theater (and basement), so the projector is covered. 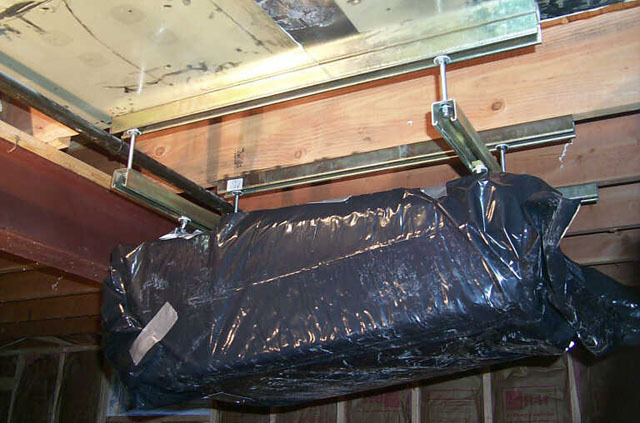 * 15 feet of channel strut ( called Unistrut, Superstrut, and Powerstrut most commonly). * 24 lag bolts - 4 inches long 3/8 inch diameter, with washers that are sized to fit in the channel (less than 1.25 inches in diameter). Good luck finding the washers. * 5 feet of 3/8 inch coarse thread rod. * 30+ washers (normal 1.5 inch washers) for 3/8 inch rod. * 30 3/8 inch coarse nuts. * About $40. You can't beat the price, considering most OEM mounts are over $200 and don't have any flexibility. Find the optimal distance from the screen to where you want the projector mounted. Decide how much play you want in the mount (by play I mean - how much do you want to adjust the unit once you have it mounted). Once you have decided how much play you want in the mount - you can cut the first pieces. The pieces you are cutting will go on the joists themselves. If you are going parallel to the joist (as pictured above) you could get away with only 2 pieces, but take the extra time and use three - you'll feel much better in the end. If you are going perpendicular to the joists then please mount a piece of 3/4 inch MDF onto the entire area of you mounting and then mount the strut through the MDF into the joist and where you have no joist - mount directly to the MDF. If you want extra play in the distance of the projector (moving the unit back and forth) then cut your strut so you have extra space left over to slid the projector front-to-back. As most people never get the distance exactly right (as you MUST if you use the manufacturer's mount) this is a great way for you to approximate the optimal distance. Then, once you setup the images on the CRT faces to get the most of the raster size - you can move the project to the "perfect" sweet spot for your screen. Bolt on the strut. You will want to pre-drill all your holes - at least to a depth of 3 inches. I used 8 bolts per strut and 2 washers per bolt. Take your time on this. You are going to want to ratchet the bolts in as fast as you can, but please don't. The bolts are going to get VERY hot and can snap if you just twist away. Take your time and do this one step by hand, don't use a gun. If you snap a couple of bolts your gonna get ticked (learn from my mistake here). A hint from forum member Gary Fritz: Rub a bar of soap on the "threads" of the lag bolt. This makes it slippery and it goes into the wood MUCH MUCH easier. You'll save yourself a lot of work and you'll be almost certain not to snap off a bolt. And while I'm talking about bolts - please buy quality bolts. Go to a Home Depot or a Lowes, whatever you have, just don't go to the local ACE Hardware, or True Value - the bolts they sell are junk (sorry, but they are, I snapped two out of three from each of them when I was testing them out). Now that you have your strut mounted to the ceiling, you are ready to cut the mid pieces. These pieces go between the joist mounted strut and the projector bracket. This piece only needs to be as wide as the pieces you have mounted to the joists. Any longer than that and you are looking at headaches on building the enclosure later (hush boxes are enough of a pain to build under the best conditions - don't make it any harder on yourself). Once you cut this piece, make sure to knock the burrs of the edges - they will slice you right open. OK, now the hard part. Calculate the height you projector needs to be at and take into consideration the distance that the projector is going to hang below this layer of strut. You will be able to adjust this ~2 inches up or down later, but do try to get it right the first time. Now cut the 3/8 inch coarse rod for all 6 pieces - 3 in front and three in back. the rod in the following order (top to bottom): Strut hanger, washer, bolt -space- bolt, washer, middle piece of strut, washer, bolt. (There is a really good close-up picture of this below, so don't worry if that makes no sense right now). Attach all of these as shown above and then you will have 2 pieces of strut with three bolts sticking out the top of each. You can now place the Strut hangers in the top channels of strut and slide them into position. 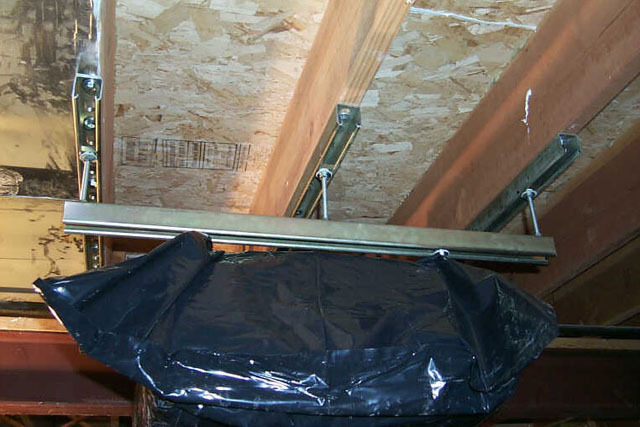 When you are done you will have three struts attached to the ceiling joists, with two struts hanging from them by 6 bolts. At this point give it a test - have some friends come over and hang on them, try to use them as a pulley and lift something ridiculously heavy (other than your projector). Attaching the projector to the hanging strut is very easy, provided you have enough strong people, or a way to lift the projector into position and slide it onto the strut (drywall lifts don't work well at all - they are usually not rated for the weight and they tend to flop back to vertical). I personally built a platform to set the projector that was 4 inches below the strut so we only had to lift it up onto the platform once and then slide it into the strut. You use the same sequence of hardware as you did to mount the struts together (this picture shows it very well). When you are done, you will have a projector with bolts sticking out the top of it. All you need to do now is slide these strut hangers into the lower piece of channel and you are done. You can then adjust the height of the projector by adjusting the length of the bolts between the struts. 1. Take your time on the lag bolts. 2. Make sure that when you hang the lower strut that you have room INSIDE the strut channel to slide the strut hanger that is attached to the projector. You don't want to find out that the projector's strut hanger can't slide because the rod attached to the top of the strut is poking down too far ( especially if you are currently holding the projector over your head). Or, you could mount the projector by lifting it straight up and twisting the hangers into the channel (impossible if people are lifting it, but EASY if you have a mechanical lift). 3. Get all the distances as accurate as possible to begin with. This can save you a great deal of time later. Just because you can adjust it as much as you want later, doesn't mean you should be sloppy in the design. 4. While you can adjust the height of the mount up and down, you can only easily adjust it up (see Hint #2) after you have the project fully mounted. 5. Be careful of the strut hangers, they can twist and come out of the channel, that is why I put a washer and bolt below them, when you have the perfect spot, tighten the bolt, the pressure of the bolt onto the cone will lock it into place. If you don't like the fact that they can twist out - look into getting "concrete nuts". They are perfect brass squares that fit in the channel and DO NOT rotate, but they are slick, while the hangers are grooved. Pluses and minuses to both - it is your call.